Have you found yourself still working on your holiday cards? Me too, I have yet to finish them, maybe I'll send Happy New Year cards instead! Trying to get one step ahead this week, I used MJ's TSSC99 for my inspiration. It's a super simple sketch, that I think will lend itself nicely to many images, as you can see I did take a few creative liberties with my finished card. 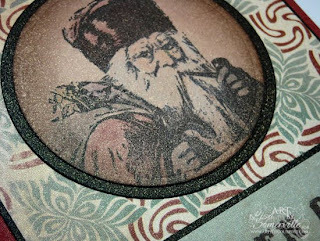 The vintage Santa image is from the Artistic Outpost Snow Woods Plate. I stamped the image in Black Archival on Caramel Ink, then colored using the Sepia Technique. I used Spellbinder Circle Dies to cut the image, then layered it onto a Black Circle. The sentiment was cut from a piece of Cosmo Cricket paper - I just love this pattern pack, it was available last year. 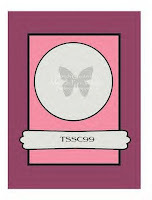 To add a bit of shimmer to my card, once completely assembled, I misted it lightly with Gold Glimmer Mist. Remember when using Glimmer Mist, shake your bottle from left to right (or right to left) to mix the paint. If you shake in an up and down motion, you're more apt to get the paint sucked up into the straw, and it will clog. If that does happen, simply remove the spritzer and run the straw under water to remove the clog. Thanks for stopping by! Be sure to check back tomorrow - there's new stamps in the Kitchen, along with a new Kitchen Sink Stamps Challenge! Very nice card, the papers and everything go so well. I love vintage! Love this card. The sepia technique makes that look just like a vintage card. Beautiful Lisa...you are such a talented designer!!! Great card, I love this image! 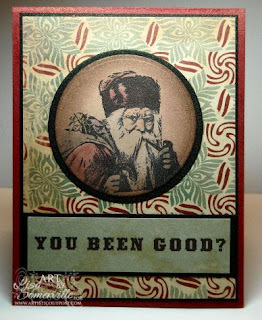 Vintage looking Santa has to be one of my favorites. What a great card, the sentiment made me giggle out loud. Love the technique used too. Perfect. Sorry I have been so busy it took me this long to get over to see it. Got to the December, lol! Thanks so much for being the constant, not many playing this week.